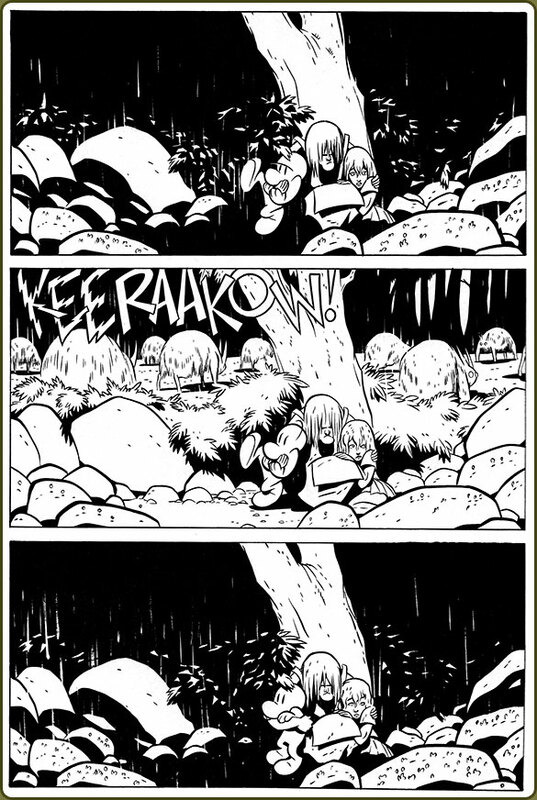 I wasn’t sure I’d ever recommend Jeff Smith’s Bone. After all, it's not like this is some rare hidden gem. Bone's so long been part of the canon of comics literature (such as one exists) that recommending it at this point is like recommending Watchmen or The Dark Knight Returns or Maus. (I mean except for that it's better than those #hottake.) Or for the non-comics-literate, it's a bit like if someone was doing a daily book recommendation and they chose Huckleberry Finn. I mean, what’s the point, really? Tell me something I don't know, right? Still. Still there *are* those who haven't read the book yet. There are aficionados of the form who need to be cajoled into reading something that will make them better participants in the comics stream. And there are those still new to graphic novels who might not be familiar with the canon and might not be aware of Good Places To Start. Smith populates his story with expressive, unique, and noteworthy characters. All of the protagonists are well-rounded and individuated (save perhaps for Smiley Bone, who remains a bastion of zany aloofness throughout). Even the supporting characters are given personalities and motivations. We spend the most time with Fone Bone and his opposite lead, Thorn, and by story’s close we see them grow through the challenges they’ve had to overcome. They are full-fledged fictional beings. Smith’s villains are worthy as well. Though he doesn’t so much follow after the footsteps of Miyazaki, making his antagonists sympathetic figures, he does at least make them interesting. Bone's story is as full-orbed and ranging as its characters. What begins as light adventure soon turns to dark mystery. And then back to adventure. And then to epic journey and battle against cataclysmic evil. And all woven throughout with a sense of myth and spirit. There are forces at work in Fone Bone’s world that are beyond the seeing eye and tap into energies outside the realm of the sciences. And I don’t mean wizards and dragons. Even though those are there too. These things work to make Fone Bone's world and mythos feel substantial, solid. And it helps that his story is exciting. 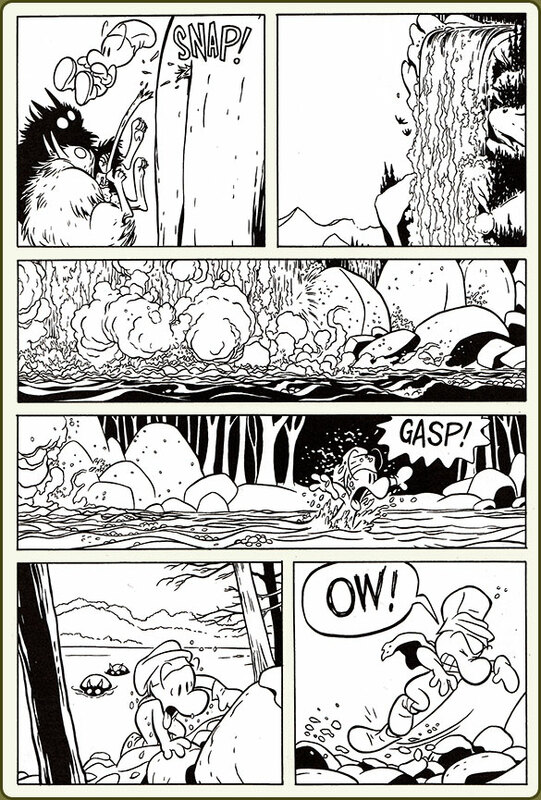 Jeff Smith is a master craftsman in regard to how he chooses to visually tell his story. Bone employs a lot of dialogue and Smith is not shy about using words. Still, he shows over and again that he knows when to shut up and let his art speak for him and his characters. 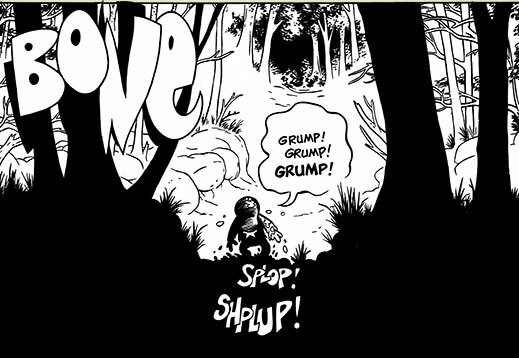 Even if Bone was entirely wordless and plotless, it would be worth your time for the art alone. At the end of the day, if you haven’t read Bone yet, you really ought to. If you like comics at all, you owe it to yourself. If you like adventure or fantasy, you owe it to yourself. If you want to read your kids something a little dangerous and a little exciting and a little funny and quite possibly the best thing your kids will have yet experienced, you owe it to yourself and to them. And if you’ve already read Bone but it’s been a couple years, you owe it to yourself. So this is weird and in a way pretty major, but I hated the ending. You already know I adore the book and think you should absolutely read this thing. It’s canon and it deserves to be so. But. But but but. I was completely and entirely sold on Smith’s world until the last chapter. The climax and even most of the denouement were stellar and right along with what Smith was doing with his story and characters. It all fit. Then, in the last pages, we see his principal characters make a decision that kind of goes wholly against who Smith developed them to be. I’m not sure why he chose that ending for his book. This is a simple chase sequence, but it’s composed masterfully. Fone Bone jumps from a snowbank onto a lower bank and makes a little progress while fleeing furiously from the rat creature who dives into the snow at his heels. (Excitement!) 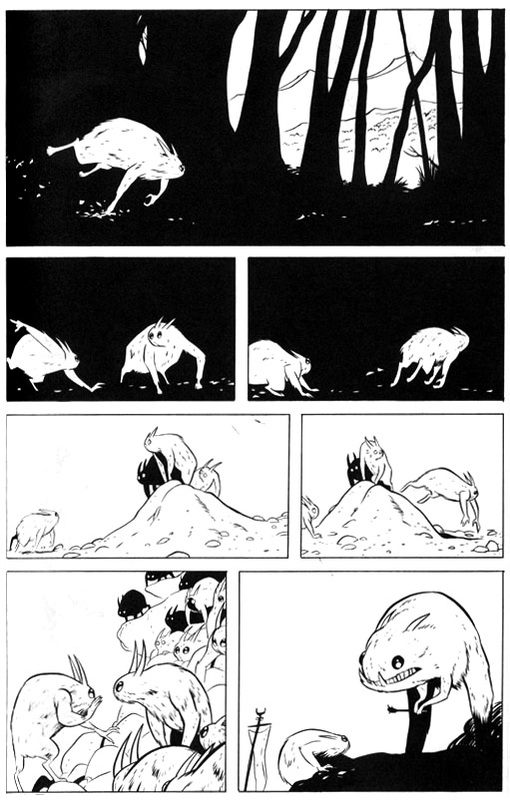 In the next panel, we see another rat creature face-first in the snow at Bone’s heels a second time. (Hot pursuit!) Fone Bone comes to an impassable river and waterfall but looks down to find an escape. We and he think he’s found a respite but are surprised to find rat creatures to be more driven by instinct than by reason. More humour on the next page as the branch fails to support their weight and the three tumble into the falls below. The second panel on this page is majestic as we see silouetted the three small figures against a mere portion of the formidable falls. If we hadn’t taken in the awesome danger Fone Bone is in by panel two, Smith drives it home by completely obscuring the three characters in the tumult of the falls’ base. The volatile energy in that scene is terrific. Panel four brings us relief again as Fone Bone breaks the surface with a gasp. 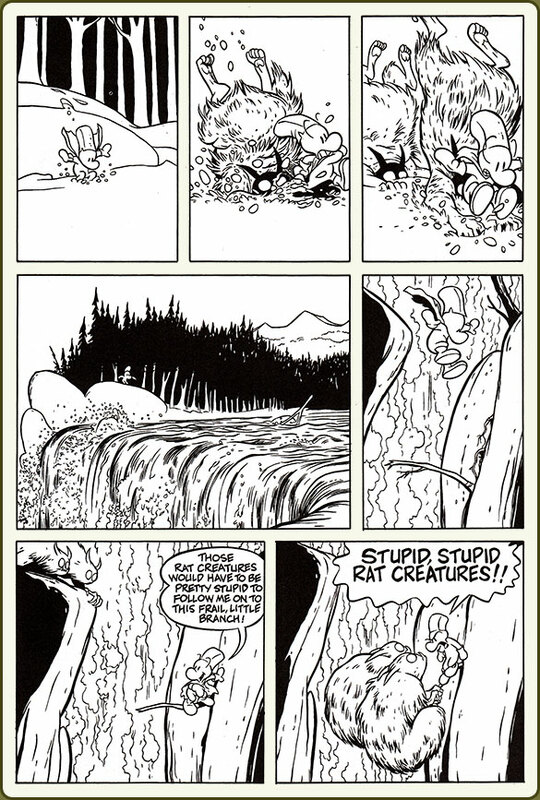 We know how lucky he was to make it but are almost instantly dismayed in the next panel to see the heads of the rat creatures breaking the surface as well, and the pursuit is begun anew. Unfortunately, wet Fone Bone slips on the icy rocks and the tension crescendoes on the final panel of that second page. While the prior example was fraught with action, this shows Smith using entirely different techniques to build tension. Across these three panels, there is essentially no movement save for Thorn’s eyes and from Fone Bone as he struggles then reacts to what he’s seen. Otherwise, Fone Bone, Granma Ben, and Thorn retain the same position across the panels. The source of drama comes from a bright lightning flash in the second panel. We (and Fone Bone) see the scene unveiled for what it is, for what was wholly obscured by the dark and stormy nighttime. Fone Bone moves from being annoyed at Granma Ben to startled by the lightning to terror at what he’s just seen. It’s a beautiful scene and the book is full of this stuff.